The bouncy castle is in the garden and the guests are about to arrive – then the rain comes! If you need some indoor party games in a hurry look no further. 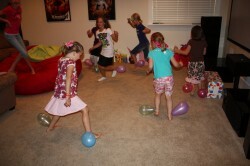 We have 10 of the best indoor party games that need no preparation and will ensure the party is still fun fun fun! Clear the room, the disco is about to begin. Just put on your best dancey tunes for the kids to show their best moves. 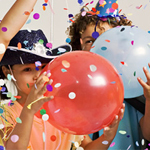 Disco party games can include best disco dancer, musical bumps and musical statues. My kids always love to play musical vampires too so when the music stops they stand still and put on their scariest face. This could also be converted to musical monsters or musical animals too. If you thought the party was going to be in the garden you may not have a prepared parcel to hand, but don’t worry there are alternatives. Pass the bear is a game where the children sit in a big circle. 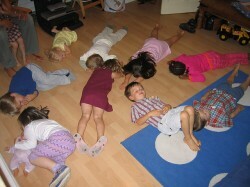 One of the children curls up on the floor in the middle pretending to hibernate. Then the music starts and the children pass the teddy bear around the circle. When the music stops the children all shout “Wake up sleepy bear” and the hibernating bear and the child holding the teddy both swap places. For larger houses with plenty of places to hide, sardines is a great game. Simply turn down the lights and count to 50 while one person hides. Then player two goes to hunt for the first child, but instead of revealing their hiding place, joins them. Keep playing until all the children are in the same hiding place, crammed in like ‘sardines’. Tie a balloon to each child’s ankle. The children must try to pop everyone else’s balloon whilst keeping their own balloon safe. This game is quite wild and noisy but great fun for the kids. The winner is the last player keep their balloon intact. Take two bowls, one containing some chocolate such as M&M’s or Maltesers. Players must try to move the sweets from one bowl to the other by sucking them with a straw. Move the bowls further apart for extra difficulty. Food party games are great fun. From the Chocolate Game to the Donut Game the kids always love them. My food party games blog gives you some extra food inspired party games. All you need is a bucket and some screwed up paper. Players try to throw the paper balls into the bucket in order to get a prize or just for fun. 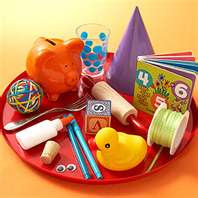 Place some interesting items on a tray and let the children try to remember everything that is on it. The game can then be played in a couple of ways depending on the age of the children playing. For older children the players must try to remember all the items on the tray. For younger players remove an object and get the children to guess what it was. Cut a hole in a box and put an object in there. The children must put in their hands and guess what they are touching. Ideas for things to put into the box include a cabbage, cold spaghetti, jelly sweets and a hairbrush. A really fun game involving nothing but a toilet roll. Put the children in groups of three or four. One of them must be the mummy and the other children must wrap up the child as much as they can using the toilet roll. Tell the children not to cover their hands or mouth. Prizes can be given for who has wrapped up the mummy the fastest and who has left the least gaps. A great game when you are nearing the end of the party. The children must pretend to be asleep and not move at all. If you see them move they are out. Children also like to play variations of the game depending on what animals they are into at the time. My own children’s favourite’s have included Sleeping Monkeys and Sleeping Puppies. 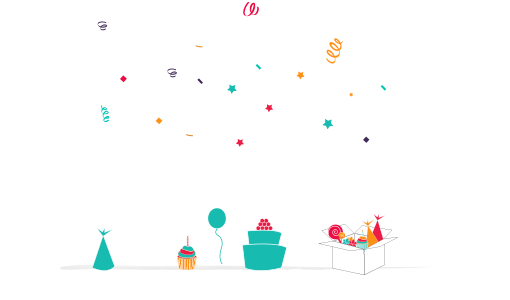 For fantastic party supplies for your party look no further than BoxedUpParty. 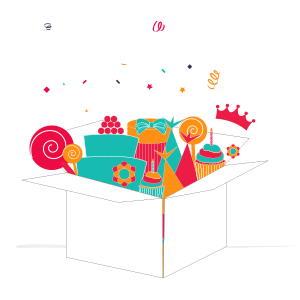 We provide complete parties boxes for your party, take a look at our website today.